In my post about pinkas, I showed an example of an Israeli notepad. If you noticed, the picture said "Kohinor". When I first came to Israel, those notepads were so common, that the name brand became almost generic, like Xerox or Kleenex (the term for this is apparently synecdoche). Pers. koh-i-nur [with a long mark over the o and the u], lit. 'mountain of light', prop. a hybrid coined fr. Pers. koh, 'mountain', which is rel. to Pers. kohe, 'hump', OPers. kaofa-, 'mountain, hump', and fr. Arab. nur, 'light'. It was clear to me that Arabic nur was related to the Hebrew נר ner - "candle". But I was curious - could the kaofa have a cognate in some Hebrew word. Over time Hebrew has borrowed words from Persian, so who knows? He then goes on to mention many words related to this root: coop, hip, cubit, incubate, concubine, succumb, cubicle, cube. The American Heritage Dictionary entry for this root adds church, excavate, cumulus. There are some very interesting words there, but aside from some cases where Hebrew clearly borrowed from an Indo-European language, there wasn't much to write about. Now before I go on, let me tell you something else about Mike. Besides our common interest in etymology, we both are very involved in genealogy. The two fields aren't all that different - they both deal with exploring roots, with a hope to get a better understanding of our past, and our present. Long before I started my blog, Mike wrote an essay called "Distant Cousins", where he discusses "Hebrew and English Words with Common Origins". This is not Edenics (or its predecessor Adamics). Mike shows how some Hebrew words have IE origins (and are therefore related to English), some English words have Semitic origins (and therefore have Hebrew cognates), and some words aren't related at all (even when we might think they are). The comparison to genealogy is obvious, if only from the title. And just as in genealogy you try to go back as far as possible, so does this essay. One of the theories he discusses there is that of the Nostratic Languages. This is something I haven't discussed on my blog until now, mostly because it doesn't have the level of certainty that I, as an amateur linguist, am comfortable with. The basic idea is that the Semitic languages and Indo-European languages may have a common ancestor for some roots. Nostratic root #87, gop‘a “hollow” or “empty,” has cognates in Indo-European geup, “hollow,” or “hole,” and in Afroasiatic gwb or gwp, “hollow,” or “empty.” An Altaic cognate is Mongolian gobi, “desert,” source of the place name Gobi Desert. 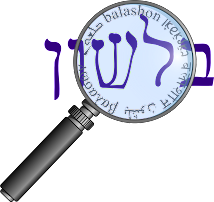 Hebrew cognates to Afroasiatic gwb and gwp include גבא, “cistern,” גבה, “collect,” גוב, “dig,” גופה, “body,” גויה, “body,” and possibly קוה, “collect,” although that might belong instead with Nostratic root #190, see below. The Hebrew root גבה is the source of גובה, “collector of funds,” hence my family name Gerver (originally Goiva), as well as גבי, “gabbai,” גוב, “swarm of locusts,” and הגב, “locust,” since locusts come in large collections. גוב meaning “dig” is the root of גב, “cistern” or “trench,” as in the place name Ein Gev. גויה is possibly the source of גוי, “nation,” according to Klein, hence, via Yiddish, goy, “non-Jew.” קוה, “collect,” is the root of מקוה, “mikvah,” a collection of water. Indo-European geup is the source of cove, via Anglo-Saxon, cubby via Dutch, and cobalt (from kobold, “house ruler,” then “household god,” then “underground goblin,” then an undesired metal found in iron ore and believed to have been put there by an underground goblin), via Middle High German. Watkins links this root with other Germanic roots beginning with ku (equivalent to geu in Indo-European), with meanings related to “hollow space or place, surrounding object, round object, or lump,” with numerous English derivatives. It is also tempting to connect these Nostratic roots with Nostratic root #243, the source of Indo-European keub or keup, meaning “bend,” “curved,” “round,” “arching,” or “hollow,” with many English derivatives, although that Nostratic root has no Afroasiatic cognate listed. The English derivatives listed by Watkins for Indo-European keub include cube, from Greek kybos, although Klein and Partridge both consider kybos to be a probable Semitic loan word. I've written earlier about the connection between כף and גב - and just as there I see a strong case to connect the roots meaning "bent", I'm inclined to see a connection between the IE and Semitic roots having the same meaning. English cube comes, via French and Latin, from Greek kybos, which, according to Klein, is a Semitic loan word, cognate to Arabic ka‘aba, “square house,” which refers as a proper noun to the black stone which Muslims visit as part of their pilgrimage to Mecca, and Arabic ka‘ab, “cube.” Hebrew כעבה, referring to the stone in Mecca, is a loan word from Arabic, not a cognate to the Arabic word from proto-Semitic. Let's return to the genealogy parallel. Often people will tell me "How can you not say that Hebrew word X and English word Y aren't related - they look so similar!" Well, in genealogy, I can't simply say I'm related to someone even if they look exactly like me. I need to go back to the roots, and even there, I need evidence. For example, in my research of my Paglin branch of the family from the town of Skaudville, Lithuania, I've found two families. Both have the same last name, come from the same town, and both are Levites. But even then I can't say they're related. Maybe for some external reason they took the same last name? cove - A recess or small valley in the side of a mountain. cave - c.1220, from O.Fr. cave "a cave," from L. cavea "hollow" (place), neut. plural of adj. cavus "hollow," from PIE base *keu- "a swelling, arch, cavity." cove - O.E. cofa "small chamber, cell," from P.Gmc. *kubon. As we saw above, Mike traces it back to *geup (as in Websters, quoted here), which may or may not be related to *keu. So they all might be related - but then again maybe not. And if they are - it's not nearly as close as it appears. Take Our Word For It writes that "there has been a suggestion that it is related to hop and that it originally denoted `jumping to safety.' Reaching a place of safety gives one hope, the theory goes on to say." And if we look above, we see that Mike mentioned that a connected Semitic root may be קוה - as in תקוה tikva - "hope"! Even the most devoted Edenics or Adamics wouldn't think to connect "hope" and "tikva". Which is why the real search for roots - in genealogy or etymology - can often be more rewarding and fascinating than playing a linguistic version of "Separated at Birth". Except for one thing. Tikva and מקוה mikveh - the word Mike actually referred to above - aren't actually connected. And they're both plain old Biblical Hebrew. Mikveh (or mikva) meaning "a collection of water", derives from the root קוה meaning "to collect (water)." Klein writes that it may be connected to Syrian קבא - "was collected", and the volume unit kav קב, which in turn comes from קבב (= to hollow out). This root would certainly be connected to the sense of "bent" that we've seen so far. On the other hand, tikva comes from a second, unrelated קוה meaning - "to wait for". It is related to קו kav - meaning "thread, string, line", and Klein says that the original meaning of the verb was "to twist, stretch", and from there to "be stretched, be strained" and finally to "await tensely". Now of course there are famous midrashim that play on the two homonymous roots. But that doesn't mean they are related. So in etymology, just like genealogy, sometimes we suffer disappointment when we think we've made a connection. But in neither case does it pay to despair - "Hope springs eternal..."